Apfelschorle (pronounced [ˈapfəlʃɔʁlə] ( listen)), also Apfelsaftschorle or Apfelsaft gespritzt in Germany, is a popular soft drink in Switzerland, Germany and Austria. It consists of carbonated mineral water and apple juice. The broader category Fruchtschorle consists of any fruit juice mixed with carbonated water, but Apfelschorle is by far the most common. 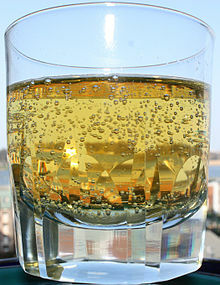 Spritzer (that is wine mixed with carbonated water) is called Weinschorle. Apfelschorle contains fewer calories and is less sweet than pure apple juice. It is also nearly isotonic. This makes it popular in summer and among athletes. Commercially available Apfelschorle generally contains between 55% and 60% juice. Brands of Apfelschorle in Germany include Spreequell and Gerolsteiner (which also sell mineral water), Rhodius, Bizzl and many other local brands. However, in most bars and restaurants, and usually also at home, Apfelschorle is mixed ad hoc from apple juice and carbonated water. In Australia, Apfelschorle is also named a "Chrissy".